Product prices and availability are accurate as of 2019-04-21 20:03:39 UTC and are subject to change. Any price and availability information displayed on http://www.amazon.com/ at the time of purchase will apply to the purchase of this product. 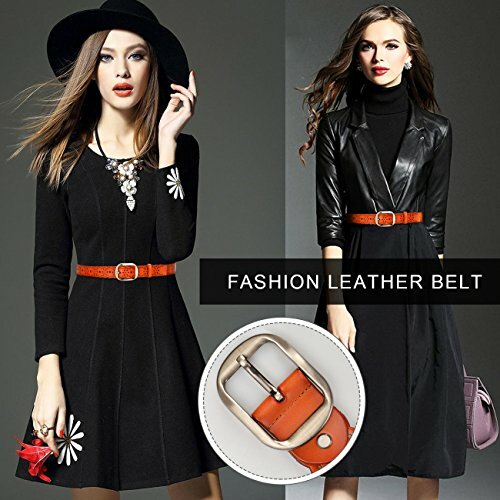 What is our designer women leather belts' advantages? 1. Quality Cowhide Leather Belt Material. - Soft & Comfortable Leather Strap with Solid Silver Buckle. 2. Fashion Hollow Flower Design. - Unique Hollow Designer Ladies Belt covers the pin holes and makes women belts look more in elegant. - More Breathable than the wide belt without hollow. Good for summer. 3. Adjustable Ladies Wide Dress Ornament. - There are 7 holes on the leather straps that flexible in the size selections. 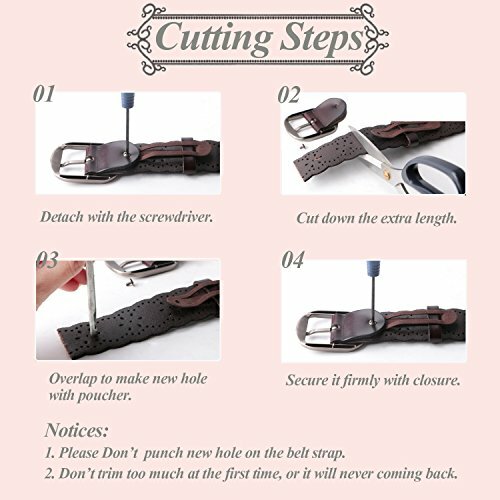 - If the belt is too large for you, you can trim this western vintage leather belt to shorter size you need following the cutting steps picture. 4. Elegant Women Jeans Belt. - Thousands of waist belts to meets different needs? for casual or formal, for any occasion. 5. Nice gift for female. Thanks Giving Day, Christmas Days and so on. 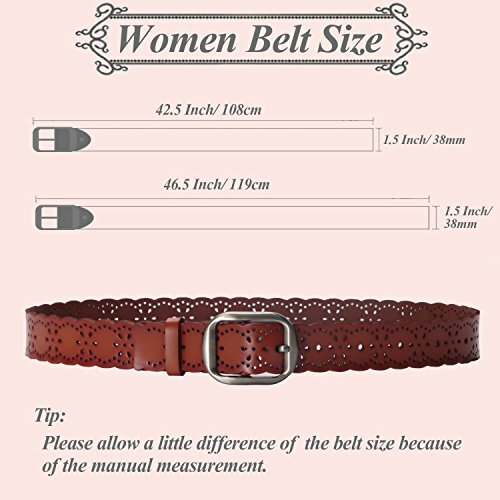 1) Please allow a little difference of the belt size because of the manual measurement. 2) Due to the different monitor and light effect, the actual color of the item might be slightly different from the color showed on the pictures. Please understand both these. Thank you! MoAnBee aims to offer quality products and services to each our customer. We always here to help! Please don't hesitate to contact us if you need our assistance.
? Hollow Cowhide Leather Belts. 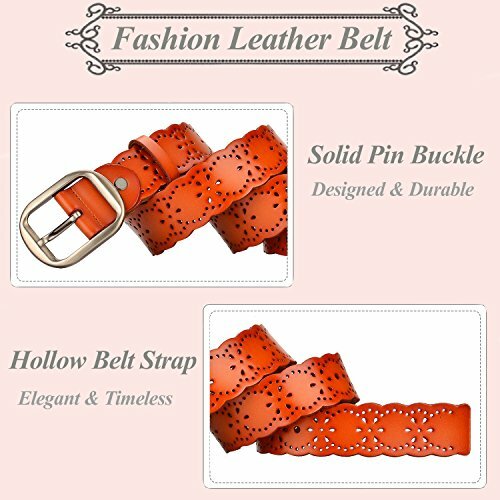 This designer women belts leather have the fashion hollow design. The hollow flower hide the pin holes that make women belts looks more beautiful and natural. It is not only a women leather belt for jeans, also a perfect accessories for dress, coat or long blouse to make you look beautiful. ? Comfortable Women Leather Belt. This cowhide leather belt is durable for long lasting use. 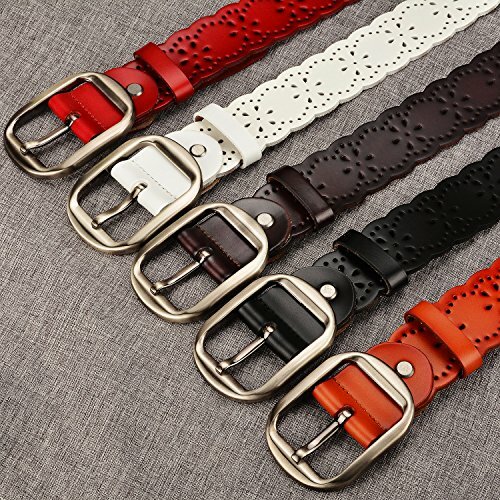 Do not like the other leather belt, this leather strap is soft, comfortable and not easy to crack or have crease.It looks nice on your clothing all the time. Its polishing silver solid buckle made of solid metal that tough and anti-scratch. ? Easy Use Ladies Jeans Belt. This ladies jeans belt has a ring to fix the belt loop. You don't have to worry about the losing belt loops. 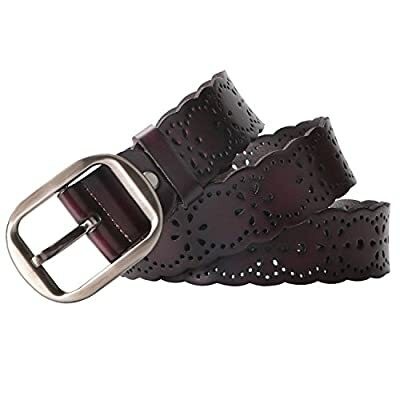 This designer leather belt makes it convenient when you use to firm the belt strap. ? Adjustable Women Wide Belt. Length One: 42.5in(108cm include silver buckle), Fit for waist size: 27-35in; Length Two: 46.5in(119cm included prong buckle), Fit for waist size: 32-40in; Strap Width: 1.5in(38mm). This removable solid buckle allows you trim it shorter to match your needs. ? Loyal Services: Every customer enjoys 45 days free returning service, contact us anytime you need and we will provide you satisfied services.